Breads made from a sponge that ferments overnight are halfway between quick yeast breads and sourdoughs, in all the right ways. They're savory, moist, and shockingly convenient. Even wholegrain sponge breads rise lightly and spring wildly. Their chewiness is breathtaking. Their crumb is coarse. Every slice is composed of smooth, shiny holes, separated by panes of translucent bread. In fact, I just recently discovered a trick for making sponge bread even holier. Now it's so holy and chewy it's almost like a sliceable, sandwich-friendly English muffin. If you're used to making standard yeast bread, you may be shocked at the tiny proportion of yeast to flour in sponge bread (here, a quarter teaspoon to 18 cups of flour). It's fine; as the sponge ferments overnight, the yeast multiplies exponentially. If you put in too much yeast, it becomes too densely populated during the overnight rise, and starts to produce a nostril-stinging alcoholic aroma. This aroma -- in a subtler form -- becomes the flavor of the finished bread. The night before baking, dissolve 1/4 teaspoon yeast in 1/4 cup warm water. Dissolve 1 tablespoon sea salt in 2.5 cups cold water. Put 6 cups whole flour (I like spelt) in a medium bowl and add the yeast and salt water. Stir/knead it vigorously for several minutes, then cover it with a cloth and let it ferment for about twelve hours in a moderately warm room -- or longer in a cold room. The next morning, the sponge will have risen up and collapsed on itself, looking spongey. Dissolve 2 tablespoons salt in 3.5 cups warm water. Add two tablespoons honey and 1/4 cup olive oil. Pour this over the sponge and mix it together with your fingers. Here's the holiness trick: knead the sponge while it's submerged in the warm water. 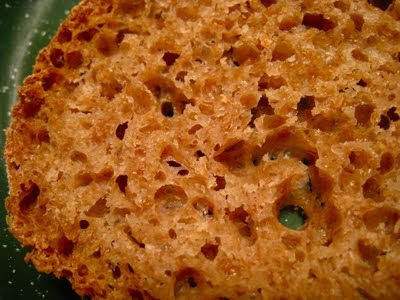 As the starches in the sponge dissolve into the water, you'll be left with firm, springy wads of gluten in your hands. Don't let it go too far, or the gluten will be too firm to mix into the dough later on. It doesn't matter if it doesn't mix in smoothly. I'm not sure why this works -- it's not like I've added extra gluten. Perhaps the underwater kneading makes it easier for the gluten to align itself into long fibers. It definitely becomes very ropy. Put twelve cups wholegrain spelt flour in a very large bowl or pot, and add the sponge/water mixture. Stir it until it's combined, and see whether its moisture level is right. This will vary tremendously depending on the flour you use. For holiness and chew, I like this dough to be almost too wet to handle. Don't be shy about adding water if you need to -- or extra flour if the dough becomes an intractable batter. Knead it, or stir it vigorously for five or ten minutes, until it feels quite springy in spite of its softness. Cover it and let it rise in a warm spot for about two hours, until it's doubled and full of spongey bubbles. Push it down, knead it a few turns, and let it rise again -- this time for about an hour. When it's risen for the second time, collapse the dough again and divide it in thirds (four if your bread pans are on the smaller side). Form each piece into an elongated round, tucking the sides to form a taut, smooth surface -- which may not hold if the dough's quite wet. Place the shaped loaves in the buttered bread pans and let rise again. When the loaves have risen well, but not too much -- nearly doubled in volume -- place them in a 425-degree oven for twenty minutes. Reduce the heat to 350 and bake until done (35-40 minutes more for medium loaves, an hour for huge ones). Intriguing. Those are some amazing holes! I'm amazed how this dough has more spring and energy than any I've worked before - about as close to an india rubber ball as dough can get -very muscle-ly! And I love its crusty exterior, moist interior. 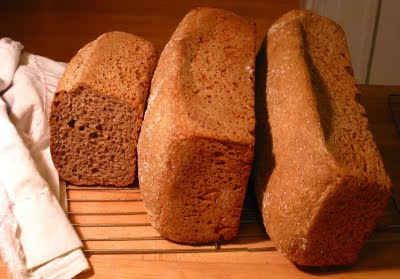 I used whole wheat, but want to try spelt the next time. Well - I'm hooked!